Like any bettor in Vegas, the Golden Knights are faced with a dilemma that’s been plaguing humans for centuries. 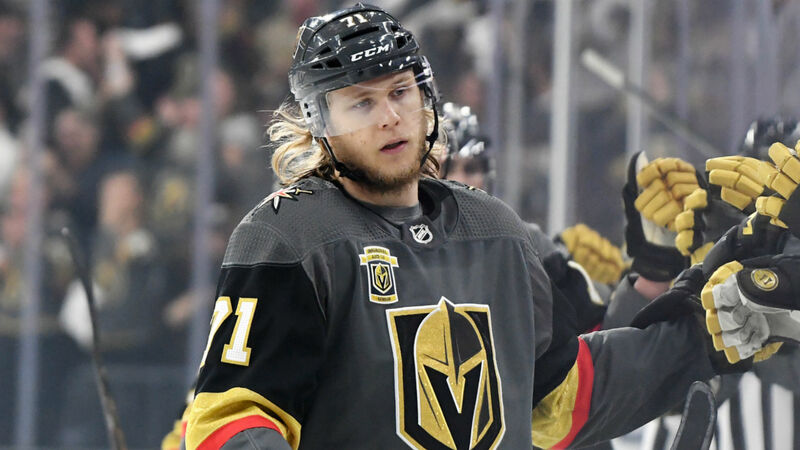 After winning time after time during the 2017-18 season, the Golden Knights can either ride out the hot hands of William Karlsson, laying down top dollar for the 25-year-old restricted free agent, or step away from the table and cash out their chips. Karlsson’s success mirrored Vegas’ inaugural season — a surprising, never-before-seen level of greatness. Karlsson, who in his first 180-plus NHL games had been a bottom-six forward, was a top producer on one of hockey’s best lines. Vegas, pegged for the NHL’s basement, fell three victories shy of winning a Stanley Cup. Each benchmark was crazy in its own right. But the Golden Knights are facing philosophical crossroads this summer, and Karlsson’s contract negotiations are at the fore. It’s rare (ie: never happened before) a player goes through a production spike like William Karlsson did this past season. Before joining the Golden Knights, Karlsson scored 18 goals in 183 career NHL games, a goal-per-game clip of 0.10. He exploded for 43 in 82 games in a Vegas sweater, scoring at a rate more than fives times as fast. Never in the history of the NHL had a skater failed to hit double-digit goals in two full seasons (Karlsson logged 81 games each of his two final years as a Blue Jacket) before going on to score 40-plus. Never. The critical, logical observer would point out Karlsson’s shooting percentage. In those first three seasons of producing at a mediocre level, Karlsson scored in 7.7 percent of his shots. And then came his trip to Vegas, where everything he touched turned to gold — and the shooting percentage skyrocketed to a staggering 23.4. For any skater last season who took at least 150 shots, it was by far the highest mark, which certainly raises a red flag. It was the highest shooting percentage in a 40-goal season for any skater since 2005. These are items that should definitely give a team pause when they’re at the negotiating table. Over the past two seasons, 12 players have scored 30 or more goals in each year, and no player has multiple 40-goal seasons. It’s really hard to score at that level consistently in this league, even for the game’s most talented players, and the Golden Knights need to legitimately ask themselves if Karlsson is a part of that group. And if not, how far removed from that tier of talent is he? The luxury of salary cap space is never an excuse to become an irresponsible spender. And because of Karlsson’s unprecedented production, it’s really hard to draw an appropriate comparable. The Golden Knights will enter this season with a considerable amount of room under the ceiling, and that’s after already having done some offseason lifting. They re-signed defenseman Colin Miller to a new contract that comes in a little below $4 million per year, added free agent Paul Stastny on a three-year, $19.5 million contract ($6.5 million AAV), and will carry the extension of Jonathan Marchessault — six years at a total of $30 million — and the absorbed contract of Tomas Tatar, with three years remaining at $5.3 million AAV. And yet, looking at Vegas’ books, it still has $13 million in cap space, and that’s with $2 million in retained salary from Derick Brassard when general manager George McPhee intervened to keep him out of Winnipeg, and with David Clarkson’s cap hit counting against that number, for now. Come opening night, Clarkson will go to long-term injured reserve, and provide a little more than $5 million in cap relief. But for a team that literally started from the ground a year ago, Vegas is beginning to be a little more cap flush than most probably anticipated. Come Year 3, Marc-Andre Fleury’s three-year, $21 million extension kicks in. That means Vegas will have a little over $54 million committed to 14 players (including Clarkson), and that’s before factoring in whatever happens with Karlsson. And consider they also need to re-sign 22-year-old restricted free agent Shea Theodore this summer, and Alex Tuch and Nate Schmidt in 2019. Even factoring in some younger guys like 2018 draft picks Cody Glass and Nick Suzuki playing on entry-level deals, there still will be a good chunk of cap tied into a core of players, and that’s also anticipating another jump in the ceiling, which could be as high as $85 million come 2019. Karlsson is 25 years old, in the prime of his career. The only other 40-goal scorer to get a new contract this summer was Nikita Kucherov of the Lightning, and at the same age, Kucherov got an eight-year, $76 million extension that will kick in after this season (Kucherov scored 39 this past season and 40 the year prior). His $9.5 million annual average value probably came in a bit lower than most expected, and he’s really miles ahead of where Karlsson is in terms of negotiating power. We’re talking about a player who is second in points in the NHL over the past two seasons, has hovered around virtually the same shooting percentage over the past four seasons, and has consistently produced at an elite level. Those are the guys you present with a blank check, and while Karlsson has that flashy 43 in the goal column, Kucherov is undoubtedly in a different class. So let’s call that a ceiling of sorts — one that Karlsson obviously won’t approach. Another player who just got a new deal is the Wild’s Jason Zucker (26), who signed a five-year, $27.5 million extension as an RFA, avoiding his arbitration hearing. His new deal carries a $5.5 million cap hit, and it comes after Zucker produced a career offensive year in just about every category: goals (33), assists (31) and points (64). Part of his improved production came from an increased role on the power play (he scored seven goals on the man-advantage after never scoring more than one in a single season) but he’s always been a driver at even strength, and a consistent scorer in that phase of the game. Again, a guy you pay for. Zucker, like Kucherov (and unlike Karlsson), didn’t “come out of nowhere.” Since 2014, he’s 25th in the NHL in 5-on-5 goals scored, per Corsica.Hockey. Of the players in the top 25, only seven scored at a better per-60 rate than Zucker: Rick Nash, Evgeni Malkin, Nikita Kucherov, Brandon Saad, Max Pacioretty, Patrik Kane, and Vladimir Tarasenko. Some of the names he outpaced included Filip Forbserg, Alex Ovechkin, Sidney Crosby, Tyler Seguin and Brad Marchand. Which is to say, comparing Karlsson to Zucker even feels like a stretch. Yes, Karlsson outscored him a year ago, but again, in terms of building a case between player-and-team, Zucker has consistently proven himself to be a goal scorer, and not one reliant on the power play. It’s a slippery slope to invest a chunk of term and dollar into a player based on a singular breakout season. But if the Golden Knights elect to extend Karlsson with term (and we’ll visit that in a second), it feels like Zucker’s contract would be at or near the floor of what a Karlsson deal would look like. What kind of contract should Vegas offer Karlsson? There’s a very realistic possibility Karlsson never scores 43 goals in a single season ever again, or even sniffs that number. That being said, if his shooting percentage regresses to 14 percent — still a very efficient number — and his goal total is reduced on the same shot volume to right around 25, those players don’t really grow on trees, either. If Karlsson ends up falling into that range, he’d still be a bona fide top-six NHL forward. It’s also likely that, whatever Karlsson does over the next few seasons, it won’t get any better. He turns 26 come January, and he’ll firmly be in the prime of his career. What you see will be more or less what you get. Except, as he gets into his late 20s and early 30s, the age curve will probably take its toll, as it does with most players, save for the freaks like Alex Ovechkin. It’s why, in one regard, a bridge contract is both a logical but tricky proposition. Karlsson will sign his new deal with the salary cap a hair below $80 million. In a hypothetical scenario where Vegas re-signs Karlsson for two years at a reduced cap charge, he’ll come out on the other side of that contract a 27-year-old unrestricted free agent on the heels of, possibly, two strong seasons, with the cap possibly approaching $90 million. Which means, a contract with an annual average value of $5 million right now, based on its percentage against the cap, will translate to around $5.66 million. There’s no chance Karlsson won’t be seeking term on that kind of deal, so not only are you buying UFA years, but giving them — at a higher cap number — to a player who will have just come out of his prime years. An extension with term would take Karlsson into his mid-30s when, barring a defiance conventional wisdom, he’ll certainly be in a steep decline. In the same breath, though, a bridge contract makes a lot of sense. It still feels like the book is out on Karlsson in terms of what he is , and a two-year deal could provide a definitive case study into what kind of NHL player the Golden Knights have. If his production does fall off a cliff, he’d be coming off a two-year contract in the range of $8 million, and even in an increased cap landscape, probably gets less than he would on a long-term deal right now. Probably. If Karlsson gets a long-term extension commensurate to his production, it’s hard to envision an AAV less than $7 million. Since 2005, 43 different players have recorded a 40-goal season . Of those 43, 24 were 25 or younger for at least one of those years. From that list, remove Connor McDavid, Auston Matthews and Patrik Laine, all of whom did it on an entry-level deal. It leaves 21 names, many of whom were given a pretty good chunk of change from their respective clubs. In 2006, the Sharks gave Jonathan Cheechoo a five-year, $15 million contract coming off a 56-goal season. In terms of percentage against the cap, the deal came in at 6.8, the lowest number among that group of 21 skaters. If Karlsson’s AAV counted 6.8 percent against the 2018-19 cap, the number would run at $5.42 million, which doesn’t seem like such a total farce in terms of projecting a number fair for both team and player. Cheechoo followed up that 56-goal season by scoring 37 (still very good! ), but then the numbers fell off a cliff. Cheechoo’s monster season came as a 24-year-old. The decline happened after 25, and he was out of the NHL three seasons later after scoring 40 goals over his final 196 games played. That feels like a cautionary tales for Vegas, not because Karlsson is bound for a downward spiral that will see him retire before the age of 30, but because regression is a very real thing. To devote that much money into a player based on one season of evidence after three dramatically different seasons, well, it’s setting up for disappointment. Even if he gets paid like a 25-goal scorer, there’s a good deal of nuance. Tanner Pearson got a four-year, $15 million deal from the Kings after scoring 24 goals in 2016-17. Coming in with term slightly above that — maybe five years in the range of $21 million-$23 million — is likely what Karlsson truly warrants. It’s not going to be that simple, though, and Vegas will really have to make a major philosophical decision before it even gets to the negotiating table with an agent. And like many decisions in Vegas, whatever McPhee and Co. decide on will ultimately be a gamble.